People can buy pretty much anything online these days, including illicit and prescription drugs. In some ways, this may be a good thing, providing people who need quick accessibility to prescription medications that they need for medical purposes the ease of refilling or ordering medications online and having them shipped directly to their house. On the other hand, it can also increase the accessibility of drugs to individuals without legitimate prescriptions and may amplify drug abuse. Other countries may not have the same types of regulations in place that the United States does; therefore, they can sell and distribute substances that may be more tightly regulated and controlled in the US. The deep web is a special “underground” online location where individuals can solicit many different things, including drugs. In 2010, Silk Road was formed and provided deep web browsers with the opportunity to purchase virtually any kind of drugs online. Providing a connection between drug users and drug buyers, Silk Road exploded in popularity before it was infiltrated by law enforcement and shut down in 2013, per Newsweek. The Internet may quite possibly be the future of the drug trade as law enforcement struggles to control new dark web sites that have appeared in the wake of the fall of the Silk Road. According to the International Business Times (IBT), the illicit drug trade has actually increased its online presence since the downfall of Silk Road, as more people may be buying drugs online than ever before. People may be drawn to purchasing illicit drugs online as it may seem “safer” and less criminal than seeking out a physical drug dealer on a street corner. 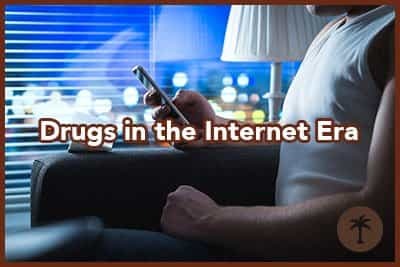 In addition to purchasing drugs online, numerous online chat groups, message boards, and drug forums exist for individuals to discuss drug use, drugs’ effects, where to obtain drugs, and the best methods for abusing them. New synthetic, or “designer,” drugs, which are man-made and chemically altered, often to avoid regulation, are popping up daily, and law enforcement officials are having a hard time keeping up. In the past five years or so, more than 400 new compounds of designer drugs, which are not technically illegal, have been identified, Science News reports. Illicit labs in countries like China manufacture drugs and send them through the mail to customers in the United States after they are ordered online. Internet use may even predict drug use patterns and behaviors, as the American Society of Addiction Medicine (ASAM) published a study on Greek adolescents that found that teens who were considered to be addicted to the Internet were more likely to abuse drugs. Internet availability may also increase a person’s access to drugs and therefore influence drug use as well. A study reported by Reuters showed that when a statewide 10 percent increase of high-speed Internet access occurred, treatment admissions for prescription drug abuse also went up a percent. The constant barrage of drug use and its relative “cool” factor by the entertainment industry and on social media may make drug abuse seem more common and desirable. The face of drug abuse has changed drastically with the surge of the popularity, accessibility, and ease of the Internet. The National Institute on Drug Abuse (NIDA) estimates that over 50 million Americans have abused a prescription medication at least one time in their lives. Opioid painkillers, benzodiazepine sedatives and tranquilizers, and ADHD stimulant medications are tightly controlled in this country due to their high abuse and addiction potential. Rouge pharmacies located outside the United States, and easily accessible over the Internet, may sell these medications regularly to individuals without a prescription and regardless of the buyer’s age. There may be more than 50,000 rouge online pharmacies out there, WUSA-9 reports, and as soon as one is shut down, another pops up. An online pharmacy may stay open for a short time, like only a week, and then shut down and open up again somewhere else, under a new name. Also, some sites may provide written prescriptions that can be purchased online and taken into a local pharmacy. At least eight states in America have passed laws outlawing electronic prescriptions or the sale/purchase of controlled substances without a legitimate prescription, The New York Times reports; however, in a survey of the 365 online pharmacy sites found through common search engines, 85 percent did not require a prescription to purchase controlled prescription medications. The Internet is likely a large part of a young adult or adolescent’s everyday life. Information published by The Telegraph indicates that young people between the ages of 16 and 24 spend over 27 hours online each week, according to data collected in 2014. The largest age group abusing prescription drugs includes young adults between the ages of 18 and 25. The National Survey on Drug Use and Health (NSDUH) reports that in 2014, close to 4.5 percent of Americans between 18 and 25 years old abused prescription drugs within the month prior to the survey. Prescription drug abuse is considered an epidemic in the United States, and online pharmacies are likely adding fuel to the fire. Some of the most common “legal” highs are drugs that are manufactured in clandestine laboratories with chemical structures and properties that may be similar to other illicit drugs. These drugs include synthetic cathinones, which are stimulant drugs often called bath salts; synthetic cannabinoids, also referred to as Spice or fake weed, which are similar to marijuana; and synthetic hallucinogens like 251-NBOMe or N-bomb. All these drugs mimic other drugs with psychedelic and psychoactive properties. They are sold in head shops, gas stations, and over the Internet, and they are often labeled “not for human consumption” in order to avoid regulation. The journal Addiction Science & Clinical Practice reports that young adults, particularly males, abuse designer drugs most often and that abuse of these substances has been increasing in recent years. Since these drugs are not regulated, individuals may not ever be able to be certain exactly what they contain or how they may affect the body. Violent, unpredictable behaviors, and toxic reactions have been reported to be consequences of designer and synthetic drug abuse, as NIDA reports on numerous calls to Poison Control Centers regarding adverse reactions to these substances. Websites often herald the effects of these drugs and the proper way to use them; however, in reality, individuals purchasing them online may be test subjects, as the interactions of many new synthetic compounds are virtually unknown. In 2012, the Synthetic Drug Abuse Prevention Act banned various synthetic drugs in the United States, placing many of the known compounds into the Schedule I controlled substance designation. As specific combinations and chemical makeups are discovered and banned, however, illicit chemists make changes to them and market them as something new, so these new formulations are technically legal. Essentially, synthetic drug manufacturers manage to stay one step ahead of the law, constantly altering their composition as soon as one version is outlawed. There’s no question that the Internet has changed the landscape of drug availability and made drug abuse more accessible to many. The Internet can also be a source of help, however. Thousands of addiction treatment centers offer comprehensive services to help people stop abusing drugs for good and embrace a better future. Take the first step toward that future today.